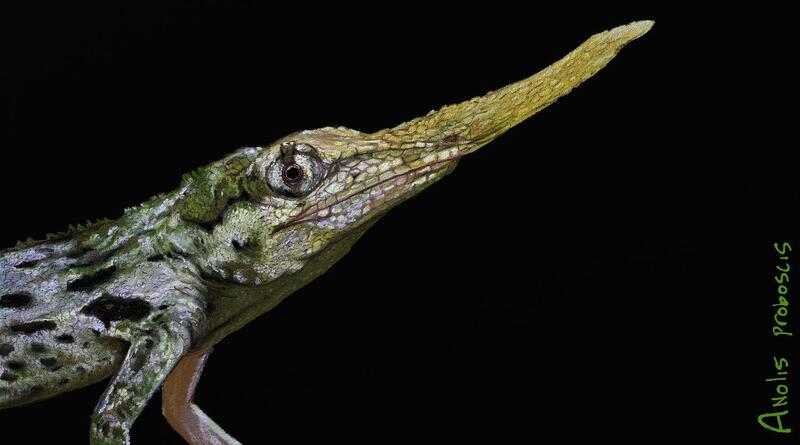 Digital painting of the endangered, Ecuador endemic ‘Proboscis anole’, Anolis proboscis. Anolis proboscis is one of three species of anole known to sport such a nasal appendage, belonging to the Anolis laevis group. These lizards have only recently been more fully described, as scientists went years without finding them. Deforestation is a primary threat to their population and the distribution of this species is currently thought to be very small, with the individuals that have been found living within a relatively limited area. James and I went on a long walk to find this species one night, in 2011. While we didn’t find the long nosed male…James somehow managed to spot a female in the trees above. I am always astounded by his ability to find creatures! The females are beautiful…and rather different from the male in coloration, being mostly green or brown and not sporting the extension on the snout. The males actually change color, too – a lot about them reminds me of chameleons.